Anything had to be better than that worthless Rally Racing Wheel for GameBoyAdvance, but this Concept 4 Racing Wheel for Nintendo 64 is actually impressively well designed in every way! This thing has a rubberized wheel, metal trigger thingies, an optional foot pedal, adjustable sensitivity, reassignable buttons, rumble compatibility, a memory card slot, and a pivoting base. As you can see, there are buttons on the wheel and they're just waiting to be pressed. Every button on the Nintendo 64 is represented here, so you'll be able to navigate menus and play any game you want. On the left, there are L and R buttons, which are in addition to the metal triggers which also function as L and R by default (you can reassign them to whatever you want by holding down the set button and pressing the buttons you want to swap). In order to move on the Y axis, you can use the analog slider to the right of the L and R buttons or the D-Pad. You can even map the Y axis slider to a foot pedal if you want. The only complaint I have when it comes to buttons is that the C buttons are not very easy to reach. Obviously, the Z button isn't either since it's in the middle of the controller, but it can be easily reassigned if the game requires it. Actually steering works great and the sensitivity can be changed by holding the Set button and pressing a direction on the D-Pad. The Concept 4 Racing Wheel does have a fair bit of cables, but they're almost all optional. First of all, is the cable connecting the pedals which control the A and B buttons and are supposedly analog even though the N64 controller's A and B buttons are digital. The function of these can also be swapped, or, since there are A and B buttons also on the wheel itself, you can unplug the pedals and not use them at all. The underside of the pedal unit also has convenient grooves which lead out the front or back so you can secure the cable in either direction. Even the power adapter is only required for the wheel's rumble function (for compatible games) and rumble can be turned on and off by holding Set and then pressing Start. Check out my video demonstration of the wheel here with Mario Kart 64, F-Zero X, Star Fox 64, and even Super Mario 64! The wheel is designed to be usable on either a table or your lap and is comfortable in both positions. It can also pivot up and down to whatever angle you find to be most comfortable. 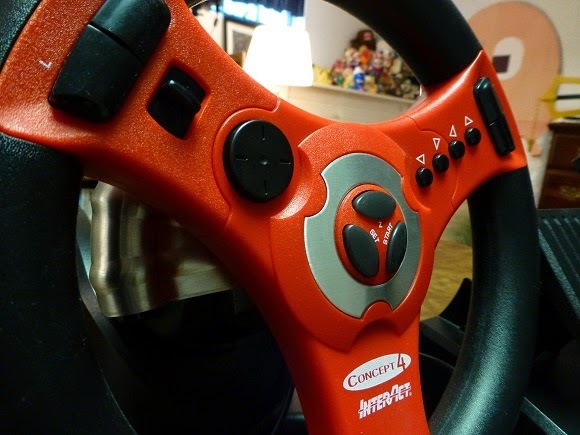 The final word: Personally, I still prefer to play racing games with a controller simply because that's what I'm most accustomed to, but if you want to play with a racing wheel, I definitely recommend the Concept 4 by InterAct. It's all around well designed, easily usable, and solidly constructed. I really couldn't ask for more. While we're on the topic of racing games, have you tried the fantastic and sadly overlooked Excitebots?